"Resistance is a decrease in pest susceptibility that can be measured over human experience," said Tabashnik, professor and head of UA's entomology department and an expert in insect resistance to insecticides. "When you use an insecticide to control a pest, some populations eventually evolves resistance." The researchers write in their report that Bt cotton and Bt corn have been grown on more than 162 million hectares (400 million acres) worldwide since 1996, “generating one of the largest selections for insect resistance ever known." "The resistance occurred in one particular pest in one part of the U.S.," Tabashnik said. 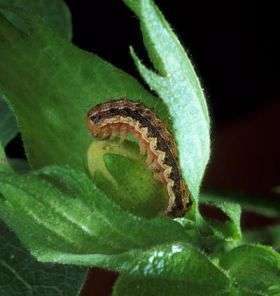 "The other major pests attacking Bt crops have not evolved resistance. And even most bollworm populations have not evolved resistance." “The only other case of field-evolved resistance to Bt toxins involves resistance to Bt sprays," Tabashnik said. He added that such sprays have been used for decades, but now represent a small proportion of the Bt used against crop pests. Tabashnik and his colleagues' article, "Insect resistance to Bt crops: evidence versus theory," will be published in the February issue of Nature Biotechnology. His co-authors are Aaron J. Gassmann, a former UA postdoctoral fellow now an assistant professor at Iowa State University; David W. Crowder, a UA doctoral student; and Yves Carrière, a UA professor of entomology. Tabashnik and Carrière are members of UA's BIO5 Institute. "Our research shows that in Arizona, Bt cotton reduces use of broad-spectrum insecticides and increases yield," said Carrière. Such insecticides kill both pest insects and beneficial insects. The UA researchers found that bollworm resistance evolved fastest in the states with the lowest abundance of refuges. The field outcomes documented by the global monitoring data fit the predictions of the theory underlying the refuge strategy, Tabashnik said. Trouble on the horizon for GM crops? The research paper tries to present resistance evolution as a rare phenomenon and declares refuge strategy as a suitable practice. This is indertandable as their (other) research projects have previously been funded by Monsanto and Tabashnik is in fact a co-author on a Bt-cotton patent! I am more worried about the failure of refuge strategy itself because of ultimately refuge plants will be outcompeted by Bt-carrying plants and what then? Add to this the possibility of Bt-transgene entering refuge germline through normal mating and apart from failure of refuge-strategy, you have an essential loss of biodiversity at hand! I am more worried about the failure of refuge strategy itself because ultimately the refuge plants will be outcompeted by Bt-carrying plants and what then? Add to this the possibility of Bt-carriers mating with not-carriers thus spreading the transgene, thus transforming the refuge itself, and so apart from failure of refuge-strategy, you also have an essential loss of biodiversity at hand!